Me and Daria and Marina went to ESDIP Life Drawing yesterday. Know who else was there?? Lee Dotson who I know from the Bay Area, who is living at Rah Hell’s place and co-working at ESDIP, both occurring totally unrelated to me. The world is small, and rich in co-incidence. We did five minute poses to start. We were blessed by Luciano, a wonderful life model. For a former comic book artist like me, there are certain body types it’s terrifically easy to draw. I am having a really interesting time switching back to markers and inkline after six months of experimenting with pastels. Towards the end we did one-minute gestures. I did two, and worked on the left-hand one for an additional four minutes, because Spiderman! For the last two poses, I drew the artists instead. Several of my students and former students were in the group, which was lovely, and I wanted to capture the moment. Also, unlike most figurative artists, I’m not that interested in naked people. Even beautiful, fit, young naked people. Daria tackled the last pose and made a terrific drawing despite the difficult angle from where we were seated. Check it out! 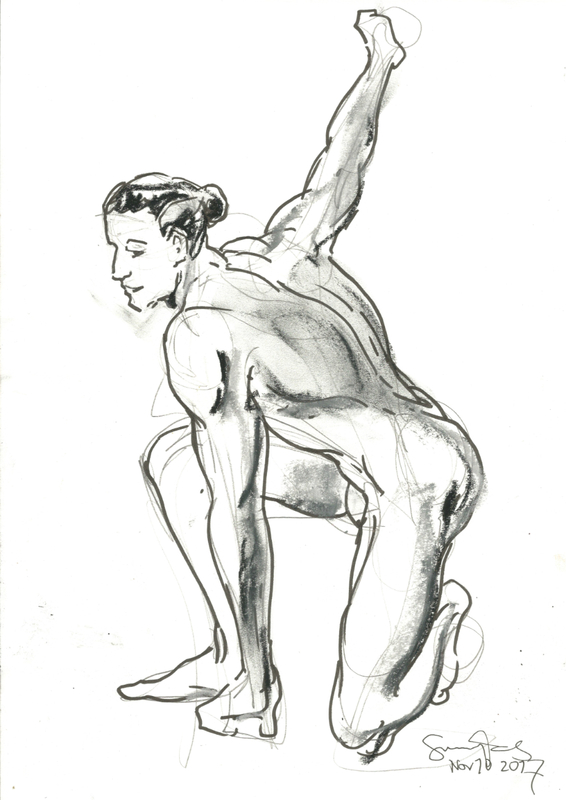 You can see my previous drawings from ESDIP Berlin life drawing sessions here, and here. Naked people warning, of course! You can come to life drawing at ESDIP once a month. And you can sign up for our Illustration Intensive Program starting again in January if you want me to teach you to draw hands like a boss! It’s the monthly financial support of my Patrons on Patreon that makes it possible for me to be a working artist. You can help, for a dollar or less than a euro a month! This entry was posted in Berlin, My art and tagged art in berlin, Berlin drawing, Daria Rhein, drawing, drawing in berlin, ESDIP Berlin, life drawing Berlin., life drawing session in Berlin, live drawing, Suzanne Forbes, Suzanne Forbes art, Suzanne Forbes artist on November 11, 2017 by Suzanne Forbes.